If you are a visual person, please check out our video below otherwise carry on reading. We have a whole series of blogs/videos for revert brothers and sisters as part of our aim to make learning Islam easier. Today I will be taking you through the different types of prayers. We have a handy chart on all the rakats you need to pray at the end of the blog. Please feel free to get your downloadable copy, that way you can keep it handy for whenever you are confused about how many rakahs you need to pray! Please note, it is sinful to miss these fardh prayers intentionally. However if you forget or something happens that does not allow you to pray salah at its recommended time then you should offer the prayer as soon as possible. Our Prophet (saw) offered extra Raka’at of prayer in addition to fardh prayers. These Prayers are called Sunnah Prayers. There is no sin on someone who does not perform these prayers but a deliberate neglect is not seen as a good thing. Four Raka’at Sunnah before Fardh and two Raka’at after Fardh in Zhuhr Prayer. Two Raka’at of Sunnah after the Fardh of Maghrib Prayer. Two Raka’at of Sunnah after the Fardh Raka’at of Isha’a Prayer. The above sunnah are Sunan Al-Rawatib (supererogatory Prayers that were stressed and regularly performed by the Prophet) also commonly known as Sunnah Mu’akkadah. There is a saheeh hadith mentioned in Tirmidhi that says “Allaah will build a house in Heaven for whoever is diligent in observing …” and then above sunnah prayers are mentioned. Please note that there are also lots of additional Sunnah prayers in addition to those mentioned above including but not limited to four raka’at before Asr and two raka’at before Maghrib etc but these are of less reward and significance in importance of adhering to them compared to the Sunnah Mu’akkadah described above. For the former prayer of four raka’at sunnah before Asr, prophet (saw) said “May Allaah have mercy on one who prays 4 rakaaat before the Asr Prayer”. With regard to latter (2 raka’at before Maghrib) it says in the hadeeth: “Pray before Maghrib, pray before Maghrib, pray before Maghrib,” and the third time he said: “for those who wish,” because he did not want the people to take it as a binding Sunnah. These are often prayed with Isha in today’s age although this is not its recommended time and it should be prayed separately to the Isha prayer. The best time to pray Witr is actually the last portion of night just before the time for fajr prayer begins. Witr salah can be prayed as any odd number, so you can pray 7 or 9 or 11 raka’at Witr as well but the minimum is 3. Note that in Witr prayer, you can make it up the following day but you would not pray it as an odd number then, instead you would pray it as an even number. This is backed by the hadith of A’isha (ra) who had said that the prophet (saw) prayed 11 Witr at night and if he missed his witr prayer for some reason, he would pray 12 in the morning. Lot of Muslims are not aware of one very important point about Sunnah prayers and that is if you miss any of these Sunnahs and would like to make up for them, you still can pray these even after their prescribed time! So for example, if you missed your 2 Sunnah of Zuhr for some reason, you can still pray them with Asr. This is confirmed by one of the hadiths of Prophet Muhammad (saw). Two Raka’at after the two Raka’at of Sunnah at the end of Zhuhr Prayer. Four Raka’at before Fardh of ‘Asr Prayer. Two Raka’at after the two Raka’at of Sunnah in Maghrib Prayer. Four Raka’at before the Fardh Raka’at of Isha Prayer, two Raka’at after the 4 Fardh and 2 Sunnah of Isha prayer . Two Raka’at after the Witr prayer. However Al-Nawawi said: “The correct opinion is that he (saw) performed the two rak’ahs after witr sitting down, to demonstrate that this is permissible, and he did not do this all the time.” The sunnah is to make the last of one’s night prayers an odd number of rak’ahs aka Witr, as reported in Saheeh al-Bukhaari. It is also preferable for men to offer Nawafil Prayers at home rather than in a mosque. For women, all of their prayers are better in their home instead of praying in masjid, however latter is NOT forbidden. One of the major benefits of Nafl prayers is that when on the day of judgement we are faced with questioning, if we have messed up with our Fardh prayers, these voluntary prayers can In Shah Allah balance things out! Tahajjud prayer does not entail a specific number of rakaahs that must be performed. It is also recommended to delay Witr until after you have read Tahujjud although this is not necessary. Two raka’at of Eid Ul Fitr and Two raka’at of Eid ul Adha…these are Sunnah Prayers for the two major festivals. There is a difference of opinion regarding these two prayers but the stronger view is these are fardh specifically for men but is a duty for all Muslims including women! If any of these are missed by men without a valid excuse, it is seen as a sin. This is the view of Imam Abu Haneefah, and was also narrated from Imam Ahmad. Among those who favoured this view were Ibn Taymiyah and al-Shawkaani. I really hope this article has helped you to understand exactly what you need to pray and when. Remember there is no rush to start praying everything at once! Start with your fardh and sunnah prayers and gradually increase as you get used to it. Islam is not about overwhelming you but for you to accept that the prayers are a part of your life like food and water. We have included a free handy guide for Know Your raka’ats which clearly sets out all the you need to pray. Download it here: Know Your Raka’ats Prayer Guide. Do leave us comments if there is anything you would like us to talk about and if you have any questions. 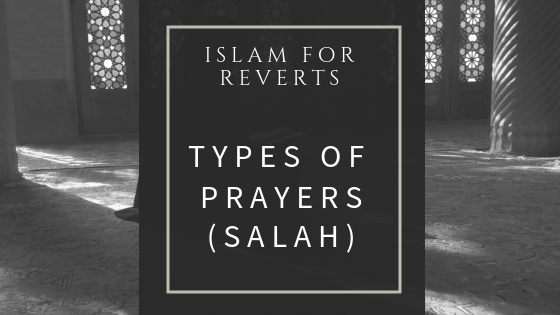 If you enjoyed this article then please check out our Islam for Reverts: Salah Step by Step Guide.